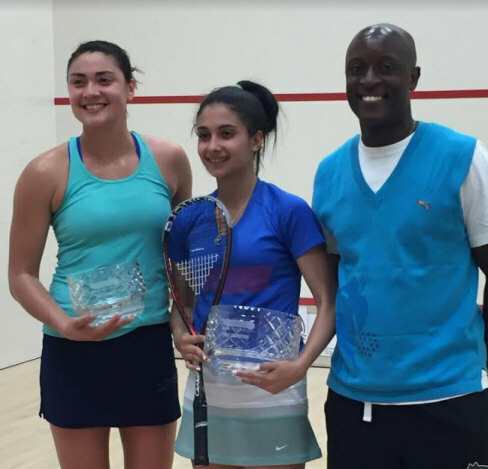 Day four provided the finals between the young, energetic Egyption Rowan Elaraby and the number one seed Canadian Nicole Bunyan. The match was being highly anticipated and the audience had a fun-spirited tone while watching. The first game started with beautiful dropshots by Elaraby which helped her gain a lead within the first 5 points. The tone of the game soon switched to long rallies with both players waiting for the perfect shot to attack. Both women hustled for every ball and had wonderful pick ups that made the rallies even more exciting. The game ended with a score of 11-6, Elaraby winning. The second game kept with the long rallies and beautiful drop shots without either of the women looking tired. The game started close with Bunyan fighting to stay on Elaraby’s heels. There were great volley nicks to finish off points as well as lobs that died right when they bounced. Bunyan came back strong from her first game lost and had two game points before Elaraby won 12-10. 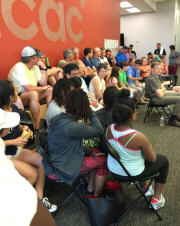 The third game was great squash and kept the pressure on both players. The points were very long and had both players running all around the court. The points also had the crowd gasping and cheering for both players. Elaraby came out strong again and went up by 5 points, but Bunyan fought back to keep the score close. The game ended with Elaraby throwing up her hands in excitement for winning the last game 11- 6. 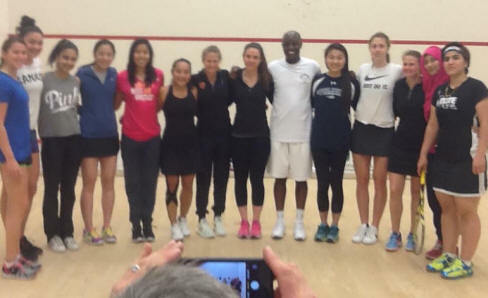 Richmond Open women's pro Quarterfinals matches started at 4pm.The alert 1-4 seeded players were ready to play against their opponents who made it the first round this morning. The second round matches provided intense, long rallies with teeth grinding games. The day also provided strong attitudes from all players and tough calls for referees. Tomorrow will hopefully be action packed semi-finals for the people watching.